Orphans were an important part of colonial North Carolina society because of high mortality rates and the large number of children present in the population. As early as 1665, William Drummond, the colony's first governor, complained that something needed to be done "to save the rights of orphans." This warning would become one of the guiding standards of the colony. Orphans were primarily treated according to their "rank and degree," with wealthy individuals being granted more attention by the law. A guardian, often a relative, was appointed to competently maintain the minor's estates-land, animals, buildings, and physical wealth such as slaves, money, and plate-and to support him or her from the interest produced. Each year this trustee was required to report on the progress of the estate, his disbursements, and the well-being of his charge. A guardian was not permitted to abuse the orphan, to neglect care or education, to misuse the legacy, or to marry the child if it was female. In the event that a court-superior, inferior, the General Court, or the more specialized Orphans' Court-suspected wrongdoing, it had the power to immediately intervene, investigate and displace the guardian, and, if necessary, take charge of the estate. Orphans with insufficient inheritance or with none at all were represented yearly as a group before the Orphans' Court by the church wardens of each parish. The very young were appointed guardians, with the parish usually supplying an annual sum of money to maintain them. Older youths were assigned to "some tradesman, merchant, mariner, or other person" until a male reached age 21 or a female, 18. The youths were expected to be fed, clothed, taught to read and write, and educated in a trade. In return they contributed labor, a commodity always in short supply. If the bargain was incomplete at the time the apprenticeship ended, the apprentice was expected to continue to pay on his contract; but if the tradesman failed to do his part, he was subject to prosecution. During the twentieth century, the care of orphans and other disadvantaged children increasingly became the focus of various state and federal agencies. Today, the North Carolina Division of Social Services maintains a number of programs for children in need, with private organizations such as the Methodist Home for Children in Raleigh providing additional resources. Report of case held in orhpans court, Reports of cases adjudged in the Superior Courts of law and equity of the State of North Carolina: from the year 1789, to the year 1798, North Carolina Department of Cultural Resources Digital Collections. 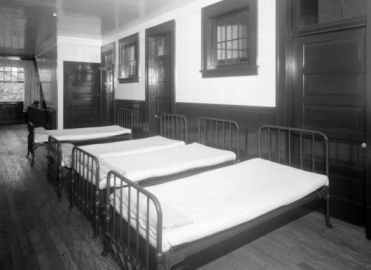 "Brown Building (interior) Methodist Orphanage, Raleigh." Photograph. Image courtesy of the State Archives of North Carolina; call #: N_53_16_4201. 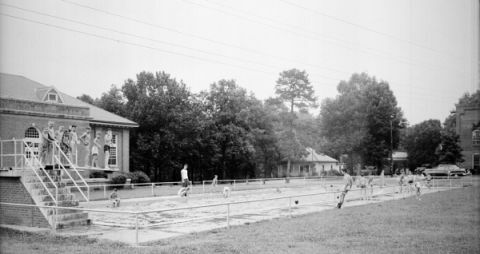 "Pool outside the dining hall, Methodist Orphanage, Raleigh." Photograph. Image courtesy of the State Archives of North Carolina, call #: N_53_16_4207. I (Eleanor Jean Wilson) was born on October 22, 1943 in Dunn, North Carolina in Harnett County to Blanche Stewart-Wilson and James W. Wilson Jr. I am trying to find out what orphanage(s) I lived in (in North Carolina) from 1943 to 1950 when my mother remarried. I need this information for my family history search. Can you please help me? Thanks for your question. I am forwarding this to our reference department for review. Hello, I was wondering if orphanages are still legal in NC? I know we have the foster care which kind of makes orphanages irrevelant. Thank you for visiting NCpedia and sharing your question. I am forwarding your question to reference librarians at the Government & Heritage Library. Be on the lookout in your email for contact from one of our librarians! The first photo in this article is an interior view of the Brown Building, call number N_53_16_4201. The second photo actually shows the orphanage dining hall and swimming pool (1953), call number N_53_16_4207. The Brown Building (exterior view) call number is N_53_16_4202.